Val Mora The valley is regarded as one of the finest mountain bike trails worldwide. The new starting point in St. Anton makes this popular tour unforgettable from day one. The Transalp Engadine tour leads through the most beautiful regions of the Alps. 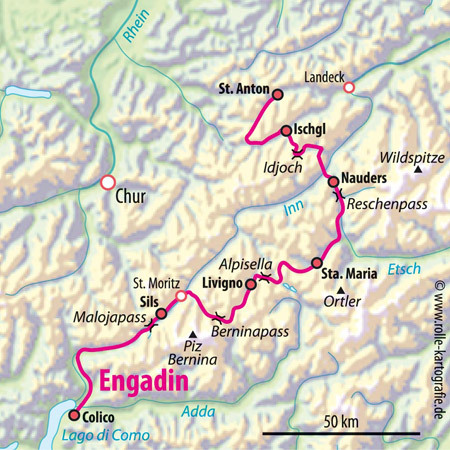 Legendary names like Ischgl, Livigno and St. Moritz are along the way. The route consists of carefully selected paths designed for "normal bikers". Not athletic records, but rather scenic excellence is what we're striving for. Comfortable sport hotels with various relaxation options are the ideal complement for our tour. In addition, enjoying the ride is always at the forefront. This is a mountain bike experience of an altogether special kind. After a high-alpine start, we'll head for the Heilbronner Hütte (2,230 m) over a strenuous passage which includes pushing your bike. But then we'll have a wonderful descent into Ischgl and our 4-star hotel with a wellness area. Today we'll surmount the main ridge of the Alps. Fortunately, a cable car will assist us in this. Unique mountain panorama at 2760m. Following the trail of the legendary Transalp Challenge, we'll ride up- and downhill towards Nauders. Overnight stay in a 4-star hotel with a wellness area and everything that an athlete might desire. The breathtaking view of the snow-covered Ortler is the highlight of this varied biking day. We'll reach the Swiss National Park. In a cozy hotel, we'll enjoy hearty cyclists' fare and listen to old smuggling tales. Today, the mountain bike shows what it is capable of. Too remote to reach on foot, Val Mora presents exceptional scenery and vegetation. From the impressive Lago di Cancano, we'll climb to Alpisella. From there we'll roll into Livigno. Shopping in a duty-free haven. Overnight stay at the chic SPA Hotel Lac Salin. The view of Swiss glaciers from the Bernina Pass is hard to beat. The easily single track to Pontresina is another highlight. The small red Rhaetian Railway line will accompany us part of the way. The diminutive mountain lakes, quaint mountain huts and easy trails of the landscape around St. Moritz will be our last impression before we turn in for the night in Sils. From now on it’s downhill. On ancient, hidden cart paths, past a waterfall, over small bridges to the border. Italian lifestyle envelops us. In the evening light, we'll reach the Mediterranean climes of Lake Como. Farewell dinner at the lake. After breakfast, the bikes are loaded onto the bus. Return trip by bus back to St. Anton. Upon arrival, everyone travels home individually. Elena Elfes, ALPS bike guide for the Transalp Engadin and Transalp Riva. Arrival: Arrival by car or by train to St. Anton/Austria. Type of route: Forest and gravel paths, asphalt secondary roads, trails, short passages of pushing and carrying. Included in the price: Guided tour with 7 overnight stays and half board (breakfast buffet, multi-course dinner menus) in 3- and 4-star hotels in a double room, often with wellness areas. Luggage transport, cable car tickets, return transfer in a comfortable bus. July: 06. /	07. /	13. /	14. /	20. /	21. /	27. /	28. August: 03. /	04. /	10. /	11. /	17. /	18. /	24. /	25. /	31.